Vision of walruses tumbling down steep cliffs in northern Russia has shocked viewers of David Attenborough’s latest documentary project, Our Planet. The second episode of the series, which is streaming on Netflix in Australia, documents the gathering of tens of thousands of walruses on a rocky beach in Russia’s Chukotka region. Attenborough explained walruses usually gathered on floating platforms of sea ice to rest during and after feeding. But he said a lack of this ice had forced as many as 100,000 of the large sea mammals to cram together on the shore to rest. Some climbed the cliffs to escape the crowd, facing a perilous journey back to the water when it came time to feed again. 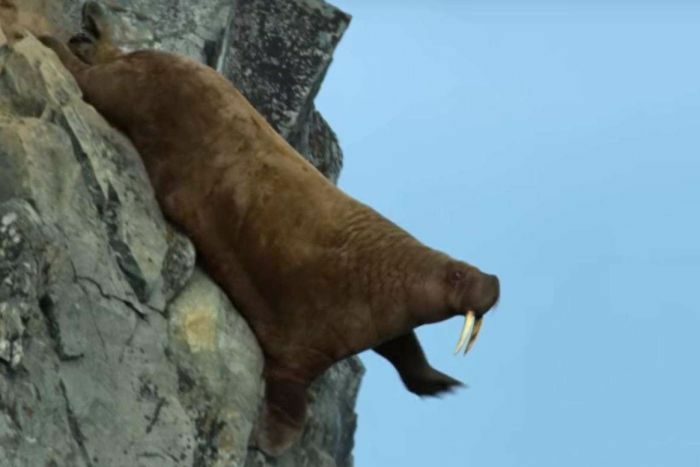 Footage aired on the program showed several walruses tumbling down the rocky cliffs, with some having an 80-metre drop. Camera operator Jamie McPherson said there were “probably two or three hundred” dead walruses on the beach. Viewers were stunned at the confronting vision, voicing their sadness on social media. The footage was shot with the assistance of Russian scientist Anatoly Kochnev, who had been studying marine animals in the area for more than 30 years. “Earlier on, when there was ice, the walruses did not need this place,” he said in a short clip posted on the Our Planet website. “They are meant to live on the ice. Now they have lost this ice platform essential for their everyday life in the Chukchi sea. “Many scientists blame this on global warming. Dr Kochnev said he expected to see the same number of walruses at the beach in the coming years, and a similar number of dead walruses left behind each season.